Although deformation is an important criterion in strength design procedures, only a limited number of experimental studies have been performed to evaluate the deformation of reinforced masonry walls under out-of-plane loads. The accuracy of the currently proposed methods for predicting out-of-plane deformation of masonry are shown to be unsatisfactory when compared to the various experimental data available in the literature. This paper presents a new and practical method for predicting lateral deformation of reinforced masonry walls under out-of-plane loads. The proposed method offers a good compromise of behavioral accuracy and simplicity of design. 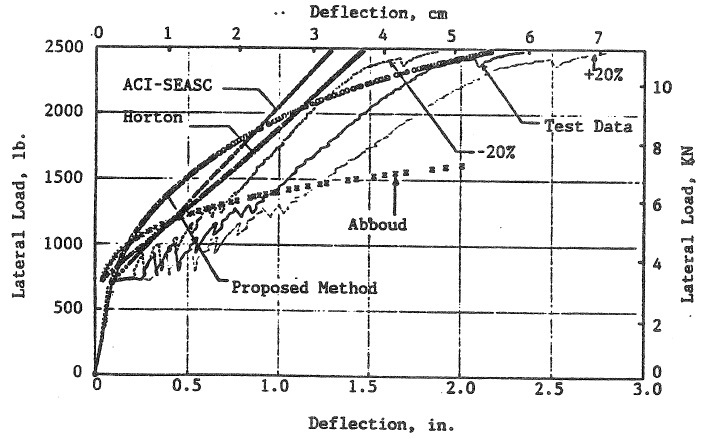 Reduction in stiffuess due to cracking under service loads and tension stiffening effect between cracks have been incorporated in the proposed method. Based on the comparison between the proposed method and all other methods available for predicting the out-of-plane deformation of masonry walls, the proposed method of predicting masonry deformation was within a +/- 20 % of the experimental data.